I asked a flight attendant when the flight began to do something but nothing was, the explanation being that sitting near an exit is cold. Please, I have sat near exit­ doors many times, often requesting them for the added leg room. I have never been as cold as I was on this delayed nine-hour flight across the chilly Atlantic. My wife wrapped me in several of what pass for blankets on Air France, thin sheets really, which did little. I put on three sweatshirts and sweaters I had in my carry-on bag, all to no avail. To make me even more uncomfortable, I was not fed on the flight either. 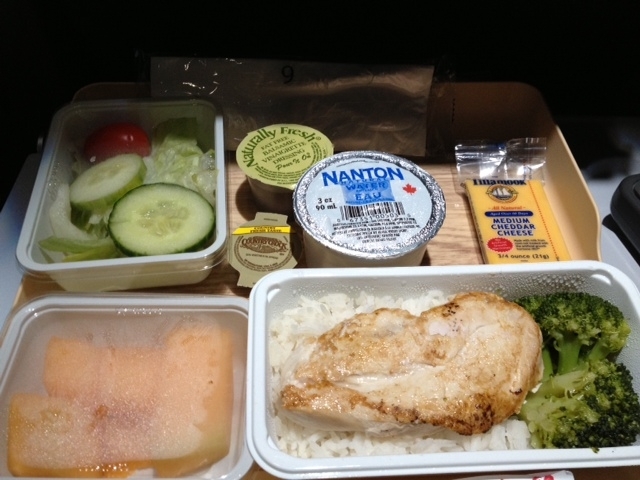 I had requested a no-salt special meal through Delta, which booked this horrible flight for me. I needed the special meal because of my health, having had an angioplasty performed last August, as my regular readers know. But when I asked for the special meal, no record of it and no meal was found, so I received no food from Air France and no water for the nine-hour flight either, being offered only a diet coke shortly after take-off. Luckily, I had brought some fruit and some Trader Joe’s high fiber cereal with me to sustain me through this horrible ordeal. So my advice to you is never fly Air France, it apparently has little concern for passenger comfort or well-being. I intend to file formal complaints with it, with Delta and the FAA when we land.